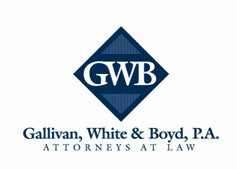 COLUMBIA, S.C. – Gallivan, White & Boyd, P.A. is pleased to announce that attorney Childs Cantey Thrasher has been selected for the Leadership Columbia Class of 2014. Established in 1973 by the Greater Columbia Chamber of Commerce, the Leadership Columbia program provides existing and emerging leaders with opportunities to enhance their civic knowledge and network. The program will provide Thrasher with insight into community issues, leadership skills, opportunities for community involvement, and access to community leaders to discuss current issues in Columbia. Thrasher’s law practice is based out of the firm’s Columbia, South Carolina office. Her practice focuses on business and commercial litigation, and environmental law, including products liability, professional liability, internet law and ADA premises compliance. Thrasher also has experience practicing in state and federal courts. She is dedicated to the community through her involvement with the South Carolina Arts Foundation, Conservation Voters of South Carolina, and the Washington and Lee Palmetto Alumni Association.